A field trip to Budapest was arranged for eleven learning disability nursing students which took place over a four day period from 9-12 December 2013. The group consisted of nine second year students and two third year students, who were accompanied by Vicky Sandy-Davis, Senior Lecturer for Learning Disabilities, and Theresa Pengelly, Senior Lecturer in Children and Young People’s Nursing and member of the Centre for Children and Families Applied Research (CCFAR). 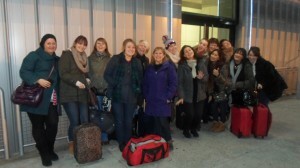 The group met at Stansted Airport and enjoyed a coffee prior to boarding. The students had reached an agreement to wear ‘Christmas Jumpers’ for the journey, and had somehow managed to coerce the lecturers to do the same! 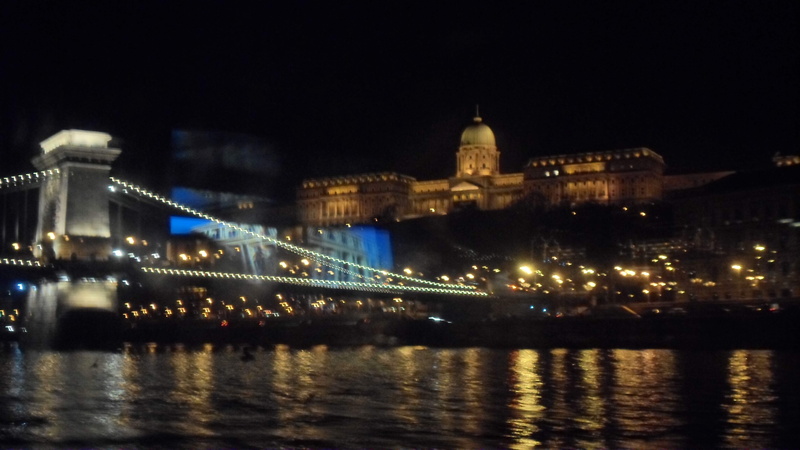 We were met at Budapest airport by a representative and a coach driver who transported us to Hotel Panda, and the evening was spent as a group at a local restaurant that had been recommended by hotel staff. 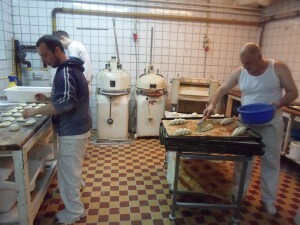 A separate room was provided for the group, and the food and service were excellent. This made for a great start to the trip. Following a continental breakfast the group were met at the hotel by Barbara, who was to be the tour guide and translator for the remainder of the trip. 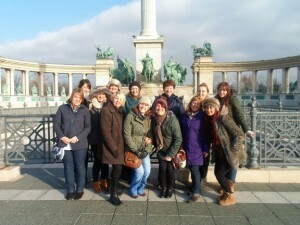 The group were then taken by minibus on a guided tour of Budapest. There were visits to many of the best known landmarks, including Heroes’ Square which was constructed to celebrate the Magyar Conquest of Hungary; The Castle Area, including the Fisherman’s Bastion which was constructed for the Hungarian Millennium Celebrations in the 19th Century, and Chain Bridge, one of the many bridges that cross the Danube, which was also constructed in the 19th Century. Our tour guide proved to be extremely knowledgeable and very helpful with a seemingly vast knowledge of the history and culture of Budapest. This was greatly enhanced by her fluent grasp of English, for which the group were very grateful. 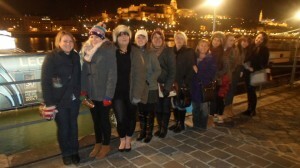 The group travelled from the castle area by a Fernicular Railway and were then given time to visit the Christmas Market. In the afternoon, the group were transported to the Philanthropic Foundation, with our tour guide again accompanying as a guide and translator. The group were met there by Mr Sandor Bereczki, the founder and president of the foundation and also the director of the Addiction Institute. He delivered a talk and presentation about the history and development of the foundation and his initiation of the concept and underlying philosophy of the organisation. The Philanthropic Foundation has been developed into a rehabilitative organisation which provides a long term home, with treatment and rehabilitation for young homeless men in Budapest. There is also a halfway house and training institute as well as a bakery, and also a carpentry workshop which is under development. The foundation gives its residents the opportunity to gain a qualification in the bakery and helps to reintegrate people back into the community after a period of approximately five years, during which they are treated for their addiction. Following the presentation the group had a question and answer session with some of the residents who were being treated at the foundation. This was found to be very enlightening, and a lengthy and frank conversation was undertaken between the students and the residents from which both groups learned a great deal about an alternative culture. The group were then given the opportunity to undertake a brief tour of part of the organisation which included the residential area and the bakery. It was ascertained that some of the residents have learning disabilities and difficulties, and the issues around substance misuse and addiction are also applicable to people with learning disabilities. This was therefore a good learning opportunity for the students. that is provided is dependent on the individual and their age, for example, there is an assessment for newborns, a sixth month to three year old group, preparation for primary school children, interventions for the parent and child, a teenage group and also support for adults with motor disorders. During our visit we met five young adults with cerebral palsy, all were from different countries but had come to utilise the facilities that the Peto institute had to offer. 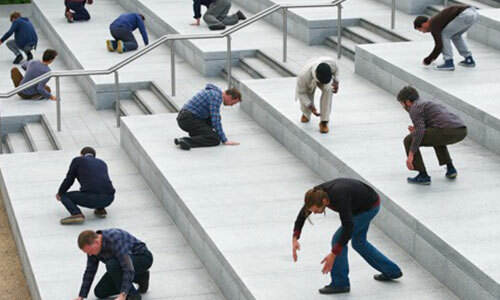 We observed a class for adults working closely on their balance and stability as many of them had dementia or experienced some form of trauma, for example, a car crash thus affecting their motor skills. Also in the children’s unit we observed skills such as learning to eat and drink with people at the table, a daily activity that the children will then feel able to do themselves during school. The classes are held by trained conductors and several support staff for both long and short periods of time where needed. The staff also set goals for individuals to achieve and promote independence. The Peto institute is committed to providing conductive training to all age groups and ethnicities of people with all types of motor disorders, with a wide range of qualified conductors. The institute had a friendly atmosphere and the clients all seemed to engage with the education being provided. It would be a fantastic place to return to for a placement or another visit. During our trip to Budapest we were able to visit the The Vadaskert Child Psychiatry Hospital and Outpatient Clinic. This visit began with a presentation in Hungarian (translated by our tour guide) by a Psychiatrist who worked in the Hospital. This was a very interesting presentation given us an insight into areas of the hospital and her personal accounts of working in the Hospital. It was highlighted in the presentation the most common reason why children attended the Hospital, these were: affective disorders (mood), conduct disorders (anti-social), eating disorders, ADHD, Autism and learning problems; we were given an overview of these conditions and were informed of how they were treated at the hospital. 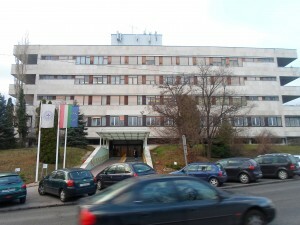 The presentation also identified how the children are deferred to the hospital, the research that is undertaken at the Hospital (research into: suicide, medication autism and Tourettes syndrome), the legal frameworks in Hungary compared to UK and the assessment tools used (some of which were the same as used in the UK). This presentation allowed us to compare the way nursing is in Britain to how it is in Hungary, making us contemplate if their methods would work in Britain. After the presentation we were then given a tour of the Hospital and were able to see the different areas in which the children are treated; the hospital was very bright and open, it had been decorated with some of the children’s artwork, making it feel less like a hospital. Overall, the visit enabled us to acquire new knowledge surrounding nursing and enabled us to obtain a clear picture of the main scope of a Children Psychiatric Hospital in Hungary. Following this visit, a cruise along the Danube was arranged by the tour guide, who managed to negotiate a reduced price for the whole group. This was a good opportunity to relax and reflect on the visit to this point. 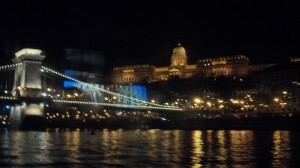 The cruise was accompanied by a narrated guide so that landmarks could be identified along the Danube. As this was the last evening of the trip, the group chose to have dinner together at a restaurant in the city centre. The students had a free morning, and some of them chose to visit the renowned thermal spa, while others used their time to visit a local shopping mall. Following lunch, our tour guide had kindly managed to arrange a talk with two of the staff at the Hotel Panda, both of whom were affected by disabilities. An interesting discussion developed in which the students were able to compare the experiences of people with disabilities in Hungary with those in the UK, both during and after the Communist era. This was a great learning experience, and some insight was gained into the first-hand experience of people with disabilities, in terms of care provision, financial and other relevant issues. The group then left the hotel and were transported to Gyongyvirag Orphanage (for which the Christmas jumpers came out again!) where a presentation was delivered by the director. A guided tour of the orphanage was also arranged, to view some of the living arrangements. There were a few children present, one who used the opportunity to practice his conversational English with the group; although the majority were at school for the day. The group found the orphanage very impressive, with a great deal of care shown to the children and the provision of a high quality of living arrangements. It was ascertained that there are a number of children in the orphanage who have disabilities and these are provided with a high standard of care. It was clear that the students found the field trip very beneficial to their learning journey. They were able to enrich their experience as student nurses with in-depth knowledge of a different cultural approach to learning disabilities. There has been some communication with the Peto Institute and the Philanthropic Foundation since the field trip, and it is evident that there may be some potential for the development of links with these organisations in the future. It is also hoped that there will be an opportunity to develop future links with the Vadaskert Clinic. It is clear that there is potential for future learning opportunities both for the learning disability nursing course and also for the children’s nursing course. This is particularly with regard to the Peto Institute, which provides for a wide range of people with various motor disorders, the majority being children with learning and physical disabilities and additional health needs. The Vadaskert Clinic also provides a high quality of service provision for children both with psychiatric disorders, as well as a range of disabilities. There would be some benefit in looking at the possibilities of short term placements or indeed, exchanges with some of the staff from these organisations. There may also be potential for future research into the service provided by the Philanthropic Foundation; there was some enthusiasm with regard to the possible development of a future relationship and this may be in part due to the philanthropic status, which may result in an issue with sufficient funding and input in the future. Overall the field trip was considered a great success by all involved and with hope that developments can continue with future cohorts.